Archangel Raphael is the third of the Archangels. During the time of Pope Theophilus, the twenty-third Patriarch, a faithful woman came from Rome, with her children and had with her a picture of the honorable Archangel Raphael. She had inherited much money from her husband. She revealed to the Pope her desire to build many churches. He showed her a large heap, which was in front of the patriarchate, which she removed and built a church in its place. Then she built another church in the name of the Archangel Raphael. The name of the angel Raphael appears only in the Biblical Book of Tobit. The Book of Tobit is considered deuterocanonical by Catholics, Orthodox, and some Anglicans. Raphael first appears disguised in human form as the travelling companion of Tobit’s son, Tobiah (Greek: Τωβίας/Tobias), calling himself “Azarias the son of the great Ananias”. During the course of the journey the archangel’s protective influence is shown in many ways including the binding of a demon in the desert of upper Egypt. 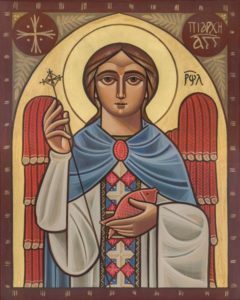 After returning and healing the blind Tobit, Azarias makes himself known as “the angel Raphael, one of the seven, who stand before the Lord” Tobit 12:15. He is venerated as Saint Raphael the Archangel. In the New Testament, only the archangels Gabriel and Michael are mentioned by name (Luke 1:9–26; Jude 1:9). Later manuscripts of John 5:1–4 refer to the pool of Bethesda, where the multitude of the infirm lay awaiting the moving of the water, for “an angel of the Lord descended at certain times into the pond; and the water was moved. And he that went down first into the pond after the motion of the water was made whole of whatsoever infirmity he lay under”. Because of the healing role assigned to Raphael, this particular angel is generally associated with the archangel.